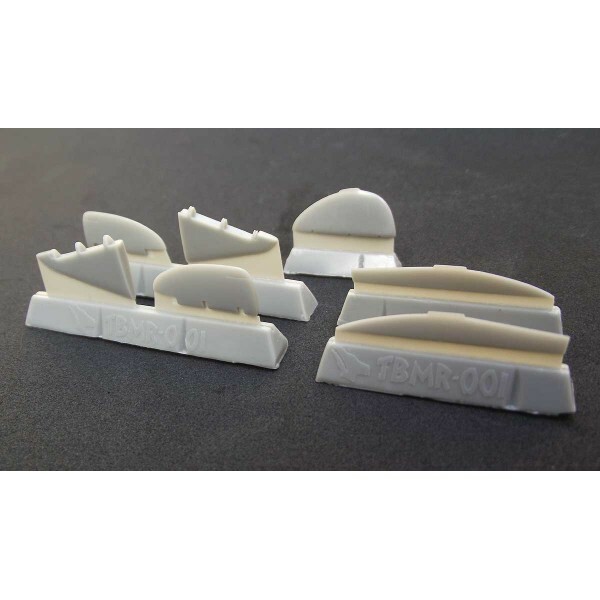 These resin control surfaces replace the parts in the Revell and AZ Models kits which are inaccurate, poorly detailed and, in the case of the horizontal stabilisers in the latter kit, thinner than the locations on the fuselage. The AZ Models wing is oversized by 4mm (approx. 1 scale foot) and 1mm in chord. The easiest way to correct this is to cut the wings off and remove the offending 2mm from each wing root with a razor saw. The ailerons in this set will fit regardless of whether the wing is altered or not, however the wing trailing edges will need drastic thinning as they are far too thick, the oversized chord can be taken care of at the same time. The Revell wing is far more accurate (and with much sharper trailing edges!) except for the ailerons which are too long. Remove them by repeated scribing and size the openings to fit the ailerons in this set. Alternatively, if the kit ailerons are to be kept in situ, fill the inboard line and rescribe 2mm further out towards the tip. To fit the rudder on either kit, remove the kit rudder and bevel the inside edges of the fin/lower fuselage hinge line so that the replacement rudder is inset slightly as per the real aircraft. Control horns can be added from thin plastic card if desired in the location marked on the resin part. The horizontal stabs will fit the Revell kit with a bit of filing of the kit fuselage halves to eliminate the curved roots. Similarly, some filing of the roots on the AZ fuselage may be necessary to ensure the trailing edges of the stabs are straight. Control surfaces may be attached in deflected positions as desired, ensuring the cockpit controls match up.